This September, Professor Aaron Wirsing joined his doctoral student Shannon Kachel in Kyrgyzstan for a couple weeks of field research. 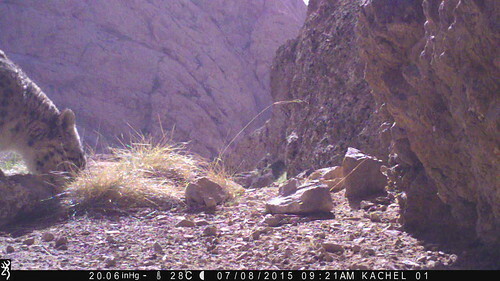 Working in collaboration with Panthera and the local managers of the Sarychat-Ertash State Nature Reserve in the Tian Chan Mountains, Shannon is exploring interactions between snow leopards and wolves, which compete for prey (argali and ibex) amid the regions’ towering peaks. Prior to returning to Seattle, Aaron also enjoyed a once-in-a-lifetime visit with his father, Robert, in the Kyrgyz capital city of Bishkek. Through an incredible coincidence, Robert—a recently retired professor—was doing his own research in the area, and they were able to rendezvous for two nights (though it took nine hours, in turns by horse and by car, for Aaron to reach the rendezvous point!). The highlight, says Aaron, was a trip to Ala Archa National Park, which offers majestic alpine vistas just 40 kilometers outside of the city. Aaron, left, with his father Robert Wirsing. Now in its fifth year (and counting), the Alaska Bear Project continues to build momentum. Working in collaboration with Professor Tom Quinn from the School of Aquatic and Fishery Sciences, Professor Aaron Wirsing just returned from Bristol Bay, Alaska, where researchers have been non-invasively studying brown bears hunting along six sockeye salmon spawning streams since 2012. Thus far, they’ve collected more than 2,000 hair samples for genetic analysis using barbed wires strung across the streams, and detected 121 individual bears. Professor Aaron Wirsing, left, and Professor Tom Quinn on the tundra near one of their bear wires on Whitefish Creek. This year, for the first time, they’ve also been collecting video using motion-activated trail cameras deployed in conjunction with the wires, and elsewhere, on each stream. They’ll be analyzing the videos to explore bear behavioral responses to the wires (e.g., do they learn to avoid them? ), and to track the timing and location of different bear behaviors, including foraging and traveling. Working with Anne Hilborn, a doctoral student in Professor Marcella Kelly’s lab at Virginia Tech, they’re also using the videos as a means to better communicate their work and findings to the public. 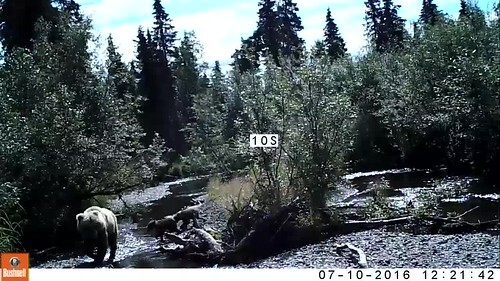 Below, check out one of their videos from this summer, which provides a great example of the type of footage they’re collecting: a brown bear mother passing by with two cubs! Photo © Blakeley Adkins; video © Aaron Wirsing. Professor Aaron Wirsing just returned from a sabbatical sojourn in Australia, where he spent six weeks as a visiting professor at the University of Sydney. Hosted by SEFS Affiliate Assistant Professor Thomas Newsome, Aaron says the trip turned out to be quite the adventure. Along the way, he logged more than 4,000 kilometers on the ground, highlighted by an epic drive from Alice Springs to the Tanami Desert along the legendary Tanami Track, which most Australians never see. He also paid visits to Melbourne for a guest lecture at Deakin University, and to Yulara for some hiking in the iconic Uluru-Kata Tjuta National Park. Wildlife abounded at every turn, including a flood plains monitor (the biggest lizard he’s ever seen), a host of small marsupials in the Simpson Desert, and numerous dingoes. For a more detailed account of his travels, and loads of additional photos, you can check out his research blog! Based at the School of Aquatic and Fishery Sciences (SAFS), the Alaska Salmon Program conducts research on ecology, biocomplexity, fisheries management and other studies relating to Alaska salmon and their environment. Part of this research, led by Professors Tom Quinn from SAFS and Aaron Wirsing from SEFS, involves investigating coastal brown bear (Ursus arctos) abundance and behavior along sockeye salmon (Oncorhynchus nerka) spawning streams in Bristol Bay, Alaska—including monitoring individual brown bear behavior through remote cameras and collecting hair samples for DNA analysis. The program involves a number of partners, including the Bristol Bay Native Association (BBNA), a consortium of 31 tribes whose mission includes providing educational opportunities to the native people of the Bristol Bay region. Each summer, BBNA research interns contribute to the Alaska Salmon Program, and this year Nadezdha Wolcott (below left) and Malcolm Upton assisted with hair sample collection as part of the noninvasive genetic component of the research.